Taking Refuge (Skt. śaraṇa; Pali saraṇa; Tib. སྐྱབས་འགྲོ་, kyab dro, or སྐྱབས་སུ་འགྲོ་བ་, kyab su drowa; Wyl. skyabs 'gro or skyabs su 'gro ba ) is the foundation of, and entrance to, all buddhist practice. It is the basis of all vows and it marks the distinction between buddhist and non-buddhist. Khenpo Ngakchung defines taking refuge as "a commitment or resolution made to seek the protection of a special object through fear of one's own and others' suffering in samsara." The cause of refuge is faith, and specifically irreversible faith. The essence of taking refuge is, to accept the Three Jewels—i.e. Buddha, Dharma and Sangha—as your refuge, and make a decisive commitment to them, in order to be free from the fear of your own and others’ suffering in samsara. You accept the Buddha as your guide, Dharma as your path and Sangha as your companions. The outer objects of refuge are the Three Jewels: Buddha, Dharma and Sangha. We take refuge in the Buddha as our guide, the Dharma as the path and the Sangha as our companions. The inner objects of refuge are the Three Roots: Lama, Yidam and Khandro. The secret object of refuge is bodhichitta, the indestructible natural state which is realized through the special sublime method of the channels (Tib. རྩ་, tsa; Wyl. rtsa), inner air (Tib. རླུང་, lung; Wyl. rlung) and essences (Tib. ཐིག་ལེ་, tiklé; Wyl. thig le). The ultimate objects of refuge, according to Dzogchen, are the three kayas within the nature of our own minds: the empty essence (Tib. ངོ་བོ་སྟོངས་པ་, ngowo tongpa; Wyl. ngo bo stong pa), cognizant nature (Tib. རང་བཞིན་གསལ་བ་, rangshyin salwa; Wyl. rang bzhin gsal ba) and unconfined compassionate energy (Tib. ཐུགས་རྗེ་འགགས་མེད་, tukjé gakme; Wyl. thugs rje 'gags med). Followers of the Basic Vehicle take refuge temporarily for as long as they live, and ultimately until they attain their own particular fruition. The followers of the Mahayana take refuge until attaining complete enlightenment. There is an example given to illustrate the difference between causal and resultant refuge: Imagine someone who is poor and suffering. On the one hand this person could ask for help from a rich person who gives refuge and protection. This is like causal refuge. On the other hand, this person could think, "Now I’m going to do whatever I can, by myself, to get rich." This is like resultant refuge. 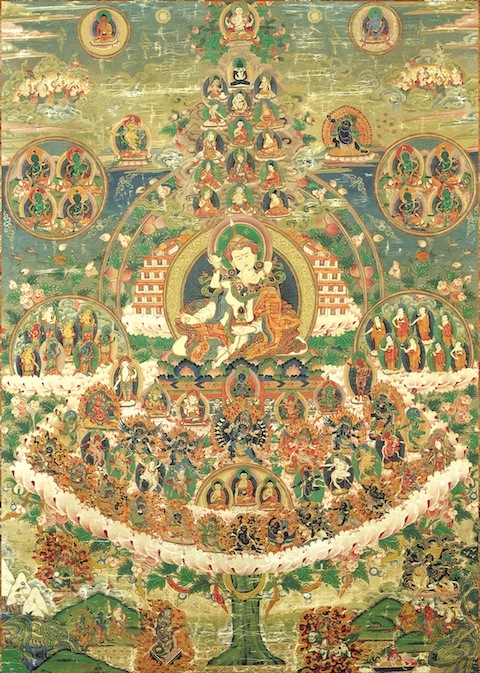 In this regard, according to the vehicle of characteristics, the wish to attain the ultimate dharmakaya and realize it in one’s mind is the resultant refuge, and to take refuge in the Three Jewels as one’s guides until this has been attained, thus creating the cause for its attainment, is the causal refuge. See Yukhok Chatralwa Chöying Rangdrol, Taking Refuge. As regards the precepts and benefits of taking refuge, in terms of precepts there are three things to be abandoned, three things to be adopted and three supplementary precepts. Firstly, having taken refuge in the Buddha, do not take worldly deities such as local spirits as your outer refuge and do not make offerings to them. Having taken refuge in the Dharma, refrain from harming other beings. Having taken refuge in the Sangha, do not associate with non-buddhist extremists (tirthikas), or anyone whose behaviour is contrary to the teachings. Regarding the three things to be adopted, having taken refuge in the Buddha, you should honour and respect any representation of his body, even a tiny piece of broken statue. Having taken refuge in the Dharma, you should respect and take care to preserve the written teachings, even fragments of paper bearing a single syllable. In the past, when Lord Atisha saw a scribe putting his pen in his mouth as he wrote, he cried out, “Atsama! That’s not right!” Having taken refuge in the Sangha, even a patch of red or yellow cloth from their robes should inspire you with faith. As supplementary precepts, rely upon your spiritual master and practise without doing anything that violates or conflicts with his body, speech or mind. Listen to the teachings and follow the Dharma and the Sangha. In this, there are six specific precepts and five general ones. In the specific precepts, there are three things to adopt and three things to abandon. Practise according to the words of the Buddha and then, without forgetting them, generate faith and devotion. Show respect even for broken fragments of statues and images of the Buddha. Exert yourself in studying, reflecting and meditating on the sacred Dharma. Show respect even for torn scriptures that represent the Dharma. Respect the sangha who are followers of the Buddha, associate with virtuous friends, and treat even tiny pieces of yellow cloth as objects worthy of reverence. Having taken refuge in the Buddha, you should not worship any gods who are still bound within the cycle of samsara. Having taken refuge in the Dharma, you should not inflict harm upon any sentient being. Having taken refuge in the Sangha, you should not associate with friends who hold extreme views. Do not forsake the Three Jewels, even at the cost of your life. Even in important ventures, do not seek other methods. Do not interrupt your regular practice. Encourage yourself and others to take refuge. Pay homage to the buddha of whichever direction you travel. Khenpo Ngawang Pelzang, A Guide to the Words of My Perfect Teacher (Boston & London: Shambhala, 2004), Part Two, Chapter One: 'Taking Refuge, the Foundation Stone of all Paths'. Padmasambhava, Dakini Teachings—Padmasambhava's Oral Instructions to Lady Tsogyal (Boudhanath, Hong Kong & Esby: Rangjung Yeshe Publications, 1999), 'Taking Refuge', pages 10-28. Patrul Rinpoche, The Words of My Perfect Teacher (Boston: Shambhala, Revised edition, 1998), Part Two, Chapter One: 'Taking refuge, foundation stone of all paths'. Thinley Norbu, The Small Golden Key (Shambhala Publications, 1999), ‘13. The Object of Refuge'. The Light of Wisdom Volume 1. Root text by Padmasambhava and commentary by Jamgön Kongtrül the Great. Published by Shambhala Publications ISBN 0-87773-566-2, pages 110-114. This page was last edited on 4 January 2018, at 03:29.